Compact, yet rugged, the SLS2 series two point, straightside press has been engineered with link motion reducing slide velocity through the working portion of the stroke by 40 percent. Die life and material springback are significantly improved. Maintenance costs are reduced. 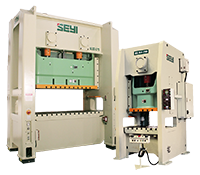 The press is especially suited to high precision stamping.